The park is on the San Mateo Coast near Half Moon Bay, just over a mile south of the intersection of Highways 1 and 92. Turn east off Highway 1 onto Higgins-Purisima Road. Proceed just over one-and-a-half miles to the park. A small graveled parking area is set aside for visitors just inside the park gate. Purchased by the State of California in 1983 this historic ranch property is hidden in a pristine valley south of Half Moon Bay. The area offers solitude, groves of mature eucalyptus, and a rich assortment of wildlife. With the addition of Rancho Raymundo at the east boundary, park property extends from Higgins Purisima Road in the west to Skyline Blvd. in the east. Burleigh H. Murray, for whom the acquisition is named, was born on the ranch July 19, 1865. His Father came to California from Vermont in 1852 following the cry of gold and working in the mines at Auburn, Placer county. In 1857 he settled at the present Murray ranch with some sheep and cattle and began a successful dairy farm. 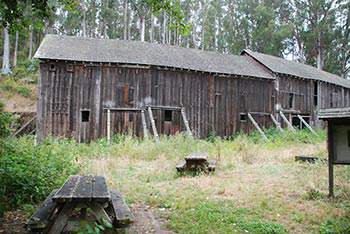 The Mills Barn and surrounding outbuildings, are maintained in a condition of arrested decay. Mills Barn hugs the hill beside perennial Mills Creek. This historic structure dates back to the late 1800's and is a good representation of an English Lake County Bank Barn. 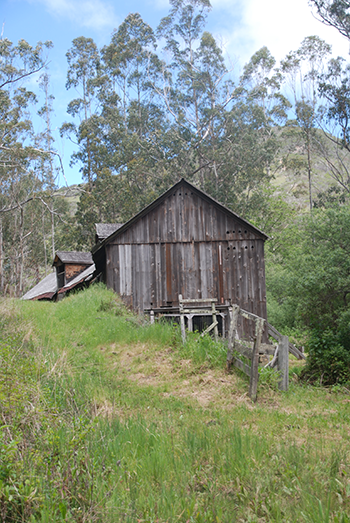 Originally 200 feet in length and capable of housing 100 dairy cows, the Mills Barn is one of two known examples of a bank barn in California. The foundation of the barn and other buildings, including an un-reinforced arched stone bridge, rely on Italian masonry techniques dating back to Roman times. The current trail consists of the old ranch road winding its way alongside Mills Creek for about one mile up to a 1930's bungalow that serves as a park residence. At this point the trail veers off the road and bends down to cross the creek allowing the visitor to look back in time while viewing the Mills Barn and surrounding outbuildings. Continuing on the road beyond the barn the valley narrows between steep, chaparral covered hill. 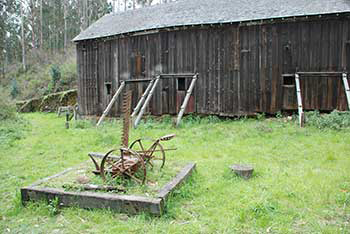 The walking is good for an additional mile above the barn past the wooden tanks supplying water for the park residence, then the trail fades away into the dense growth of stinging nettles, poison oak and coyote brush. WATER is NOT available in the park.